Born 1644 at Yorkshire, England. Died 22 October 1689 at Casco, Maine? In 1670 resided at Dover, New Hampshire. In 1678 resided at Casco, Maine. Born 1654 at Doverneck, New Hampshire. Died Harwich, Massachusetts. Married 1656 at Strafford, New Hampshire. a. Joshua Bramhall: See generation 11, below. Born 26 March 1682 at Strafford, New Hampshire. Died 21 June 1763 at Plymouth, Massachusetts. Daughter of Samuel (b. Plymouth, MA) and Lydia (Tildon) Rider. a. Joseph Bramhall: See generation 10, below. Born 20 December 1714 at Plymouth, Massachusetts. Was a sea captain. Died 26 January 1753 at Jamaica, West Indies. Born 1729 at Plymouth, Massachusetts. Died 1754 at Plymouth Massachusetts. Married 26 November 1747 in Massachusetts. a. Edmund Bramhall: Born 23 June 1749.
b. Joseph Bramhall: See generation 9, below. c. William Bramhall: Born 21 June 1752. Born 4 January 1750/1. Baptized 23 November 1753 at Plymouth Church, Plymouth, Massachusetts. Died 1805 at Meredith, Delaware County, New York. Between 1765 and 1775 moved from Plymouth, Massachusetts to Dutchess County, New York. Born 18 May 1750 at Rochester, Plymouth County, Massachusetts. Died 16 Sep 1823, age 72. Married Joseph Bramhall, Jr. on 31 March 1774 at Plymouth, Massachusetts (per page 8 of “The Bramhall Family” (Library of Congress # 1CS71.B8165-1903) by Frank James Bramhall). After Joseph died, Experience moved her family to Franklin, Delaware County, New York. a. Ivory Bramhall: Born about 1775.
b. William Bramhall: See generation 8, below. c. Jerusha Bramhall: Born 11 February 1777.
d. Polly Bramhall: Born 1778 at Plymouth, Massachusetts. (1. John C. Stowell: Born 20 February 1817 at Bainbridge, Chenango County, New York. f. Joseph Bramhall: Born 5 September 1789 in Delaware County, New York. h. Olive Bramhall: Born 1793.
a. Mattie Bramhall: Born 30 June 1800. Died 1 July 1800. (1. George Remington Bramhall: Born 22 August 1822 in Bradford County, Pennsylvania. (2. John Bramhall: Born 1824. (3. Polly Ann Bramhall: Born 19 November 1825. (4. Charles Atherton Bramhall: Born 1831. (5. Tredway Kellog Bramhall: Born 2 May 1832 at Sugar Run, Bradford County, Pennsylvania. (6. John Jayne Bramhall: Born 22 September 1834 in Pennsylvania. (7. Mark Bramhall: Born February 1836. (8. Joseph Bramhall: Born 15 April 1838 in Pennsylvania. (9. Martin Luther Bramhall: Born 22 October 1839 in Pennsylvania. (10. Nathan Wells Bramhall: Born 6 April 1841 in Bradford County, Pennsylvania. According to Marian Biles: “old Moses was not a man that drank in particular, but somehow, in later years, he got real drunk and shot his wife! !” He apparently spent 10 years in prison for his crime. c. Polly Bramhall: Born 28 September 1804. Died 17 May 1816 (age 12 yrs, 8 months) at Tunkhannock, Pennsylvania. (1) Melvin Edmond Bramhall: Born 23 December 1842. Resided at Baxter Springs, Kansas. No children. (2) Charles Olin Bramhall: Born 5 August 1845. Married Julia C. Davis and resided at Kansas City, Kansas. e. Sarah “Sally” Bramhall: See generation 7, below. (1. William Bramhall: Born 29 December 1833 in Pennsylvania. (2. 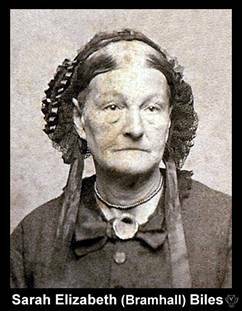 Martha Bramhall: Born 9 June 1836 in Pennsylvania. (3. Charles Atherton Bramhall: Born 30 December 1839 in Pennsylvania. (4. Mallory/Malery Donley Bramhall: Born 12 August 1841 in Pennsylvania. (5. Lamando Bramhall: Born 9 December 1843. (6. Mary Eliza Bramhall: Born 12 April 1846. (7. George W. Bramhall: Born 19 May 1850 in Pennsylvania. g. William Bramhall, Jr.: Born 13 May 1813 in Wyoming County, Pennsylvania. Died 18 September 1872 at Mount Auburn, Iowa; interred Mt. Auburn Cemetery, Cedar Township, Benton County, Iowa. 1850 US Census: Employed as a carpenter in Bradford County, Pennsylvania. 1860 US Census: Employed as a carpenter in Mt. Carroll, Carroll County, Illinois. 1870 US Census: Employed as a farmer in Cedar Township, Benton County, Iowa. (1. William Henry Bramhall: Born 20 April 1847 in Pennsylvania. (2. Virginia Elizabeth “Lizzie” Bramhall: Born 30 May 1848 in Pennsylvania. (3. Francis “Fred” Marion Bramhall: Born 20 August 1849 in Pennsylvania. (4. Nathalia Ethel “Hattie” Bramhall: Born 19 March 1866 in Iowa. h. George Bramhall: Resided at Chicago, Illinois and was said to be a “big man,” as well as Jessie Bramhall’s uncle. i. John Bramhall: Born 21 January 1815 at Tunkhannock, Pennsylvania. Died 1890 at Alma, Nebraska. 1850 US Census: Employed as a farmer at Belfast, Alleghany County, New York. 1860 US Census: Employed as a farmer at Elk Horn, Carroll County, Illinois. (2. Sarah “Lucy” E. Bramhall: Born about 1847 in New York State. (3. Charles Franklin Bramhall: Born 31 July 1851 in New York State. (4. Henry Smith Bramhall: Born 1856 in Near Berry, Illinois. j. Obediah Bramhall: Born 18 April 1817. Died 23 December 1817.
k. Lephia Ann Bramhall: Born 6 December 1820. Died 8 May 1857.
l. Mary E. Bramhall: Born 25 July 1822. Born 15 April 1808 at Towanda, Bradford County, Pennsylvania. Died 5 March 1868/26 April 1879 at Towanda. Married John Patterson Biles, paragraph 3.c. (1) of the Alexander Patterson Biles page and generation 7 of the Ancestors of John Addison Biles, on 13 February 1825.